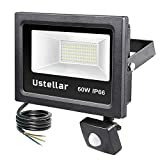 【Energy Saving】 Ustellar 60W led flood light can replace 300W traditional halogen bulb by 60W LED, save 80% on electricity bill of lighting. 【Waterproof】 IP66 waterproof rating ensures that your led outdoor flood light won't give in to the elements. 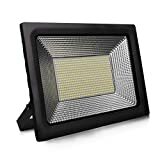 No matter the weather, the Ustellar LED floodlight can handle it. 【Efficient Cooling & Long Lifespan】 The fixture is designed with a fin type heat sink, which means it acts like a radiator to dissipate heat And extremely long life reduces re-lamp frequency. Save labor cost to replace bulbs with short lifespan. 【Super Bright】 Bring the best and brightest lighting to your application with an incredible minimum of 75lm/watt. Illuminate the darker corners of your workspace! 【3 Years Warranty】 Three years unlimited warranty means we've got you covered! Contact us for an easy and fast solution. BRIGHT & ENERGY EFFICIEN---100W, 220V, 10000 lumen, 544pcs high LEDS Chip, saving over 65% on your electricity bill. 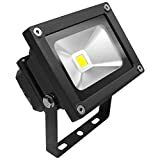 WIDE BEAM ANGLE---120 Degree beam angle, no shadow or glare, providing great bright light.The range of lighting is wide, and in the night lights the park, post, garden, rim side, garage etc., provides a nice lighting effect and also has crime prevention effect. QUICK HEAT DISSIPATION---Helps heat dissipation quickly in case any over heated. IP65 DUSTPROOF WATERPROOF---Enhances coking inside, guarantee dust-proof / waterproof performance equivalent to IP65, use it in rainy outdoors or dusty environments. 【Two light mode】 When the battery is strong, the light is cool white; When the battery is low, the light is warm white. 【IP65 Waterproof】 Protects against splashing water from all directions. MULTI-COLOR& DIMMABLE: With the provided remote controller, 16 different colors of lights are available, and you can adjust the brightness. 4 MODES AVAILABLE: It offers you 4 kinds of color changing patterns, including flash( 1 second a time), strobe( 3 seconds a time), fade and smooth. MEMORY FUNCTION: the color and mode remains on your previous setting when turn on again. DURABLE: With the qualified aluminum housing, it has a better heat dissipation performance, making the light much more durable. VERSATILE: With IP65 rating, it's greatly suitable for both indoor and outdoor usage, including birthday party, night time barbeque, garden lighting, stage lighting, etc. 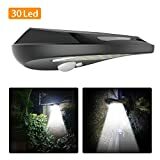 【Smarter Motion Sensor】: This outdoor security lights have unique 120 wide angle sensor can detect movements from 10 to 26 feet (3 meters to 8 meters). The lights will come on at full brightness from dimly lighting when PIR senses movement and will keep full brightness 30 seconds when people away from sensing distance then turn to be dim . 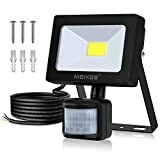 So these outdoor solar lights save power and own more longer lifetime than other products. 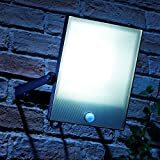 【Ultra Bright LED Solar Lights】: This outdoor solar security lights own ultralbright 30 Led beads and adopt level-tilt shape design of the lights with the integrated solar panel. The lights illuminate a large area space without leaving a dark corners and intrusiving to neighbours. Also, you can see keys you were looking for when coming home at night and will give you extremely impressed! 【Three Modes】: There is a light sensor built in so the lights won't activate in daylight, they will start to activate just as it starts to turn to dusk. 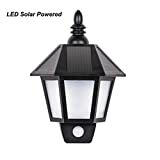 The solar security lights have 3 modes: On/Off, Dim Light Sensor Mode and Sensor Mode to meet your diverse demands. All changeable via a switch on the bottom of the unit. NOTE: The sensor would be affected by low temperature on winter, which cause the light won't sensitive enough to detect a movement. 【Eco-friendly & Durable】: Solar powered light ensure efficient long-time lighting as photovoltaic conversion rate is up to 17%. 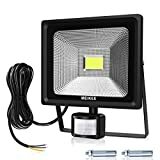 This security lights lighting 8-10 hours after charging 6-8hours in Sunshine and work 5-6 hours when charging 6-8 hours in cloudy. 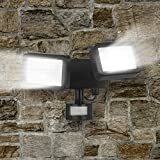 And outdoor wall light made of durable ABS material, you don't need to worry about the rain. IP64 waterproof make it works well for in most kinds of weather. 【Easy Mounting & Perfect Warranty】: You can simply mount LED solar motion sensor light on the wall with included screws. The ideal installation height is around 5.6-6.6 feet.It's a perfect choice to be used in garden, patio, yard, driveway, outside wall etc. We try our best to better your shopping experience. 【High Performance】 Replace 300W traditional halogen bulb by 60W LED, produces up to 4800lm high brightness clear white light, provides efficient lighting for your exterior living environment and adds extra safety for your home. 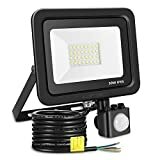 Super Bright Lights: 20 powerful LED lights provide excellent illumination for your garden, patio, deck, yard, fence, driveway, or outer walls. Much brighter than 8 LED lights in the market.PLEASE NOTE: If the sunlight is not strong, the battery may not be fully charged, so the lighting time and brightness will compromise. 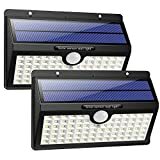 ECO-FRIENDLY, SOLAR POWERED LED WALL LIGHTS: Our weatherproof LED lights feature both a silicon solar panel and a 1200 mAh rechargeable lithium-ion battery that charges itself using solar energy efficiently. IP64 WATERPROOF, WEATHERPROOF, EASY WIRELESS INSTALLATION: These solar lights can withstand everyday use whether it's sunny, rainy, hot or frosty. Being wireless, IP64 waterproof, heatproof, rust-proof, lightweight and portable, you can effortlessly install/mount them anywhere on a wall, fence or step without any wiring. Automatic Lighting. 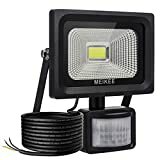 Light automatically on at night or in darkness when human movement is detected within a wide motion angle of 120 degrees and distance up to 26 feet. 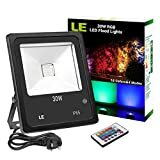 Light automatically will off after lighting around 30s. Strong Light Sensor Mode:Integrated with infrared sensor and light sensor. When people go through the sensoring area, the light will be strong. And the light will turn off after people leave the induction area. And the solar light will auto turn off to recharge by sunlight in daytime. 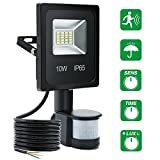 【Waterproof 】:Except indoor use，IP 65 rating waterproof make led security light with motion sensor is also ideal for outdoor use.The led flood light can be install easily on wall or eave with screws, suitable for patio,garden,storage,yard,garage,outdoor wall,driveway,warehouse,deck,entrance,pathways etc. 【Saving Energy/Long Life】:The outdoor lights with 120° tilt areas, 6000K,900 Lumen high output LED ,save 80% on electricity bill to achieve the same lighting of 60W HPS bulb.Long-lasting LED technology provides 30,000 hours of maintenance-free, energy-efficient operation. 【Sensitivity】:The PIR motion garden lights is sensitive and dimmable , automatically illuminates when it detects the movement of people or animals. 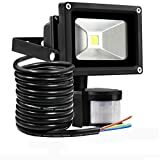 Very convenient and saves energy.Internal power 100-240V isolation driver,which make the motion sensor floodlights has high efficiency, less heat, longer life expectancy.The High quality and well package. Energy saving. achieve the same lighting: 60W halogen bulb Equivalent. 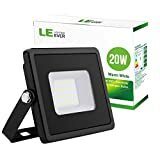 Save 80% on electricity bill. VOICE CONTROL:Compatible with Amazon Echo and Google Home for voice control,rename to each Wireless Plug and communicate each plug by name when making a voice command,instantly turn on or off electronics by voice control,like'Alexa,turn on the light'. WIRELESS CONTROL:Control home devices plugged in wireless plug with Free "smart life" app on your smartphone and tablet.When you go out, you don't have to worry about the on/off of the appliances in your home. 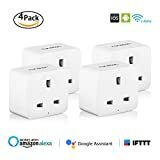 TIMING SETTINGS:Mini wifi socket could create multiple schedules to turn on/off your light,air-conditioner,water heater,coffee maker etc,save energy and money.For example,set a time when the lights will turn on automatically in dusk,people mistakenly think you are at home,safe living. ENERGY SAVING:This wireless smart socket has the certifications of CE,FCC,ROHS,is equipped with high-tech chip,a safe smart switch to save energy,preventing overcharging and overheating.It will extends home devices battery life. EASY TO SET UP:Scan the QR code on the user manual and install free APP,please click register and set up an account on the APP,connect the socket,done.Note reset the plug by press the switch button 3-5 seconds till it flashing before connecting,please note it only works on 2.4G wifi. BRIGHT & ENERGY EFFICIENT: 1600 lumen, great replacement for 200W old halogen floodlight, saving over 90% on your electricity bill. 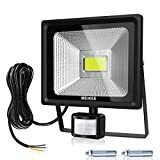 WIDE BEAM ANGLE: 100° beam angle, no shadow or glare, providing great bright light. 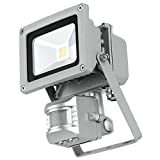 DURABLE: By adopting qualified aluminum material, this flood light has excellent heat dissipation, making it more durable. FLEXIBLE INSTALLATION: With the metal bracket, it can be ceiling-mounted, wall-mounted, and ground-mounted. The lamp body is 360° adjustable. 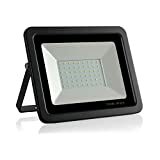 VERSATILE: With IP65 rating, this adjustable floodlight can be widely used in outdoor and indoor lighting projects, including billboards, show windows, gardens, warehouses and security lighting. 【Super Focus & Bright Light】The electroplating light board improves relefection effect, which makes LED light more concentrated and bright. 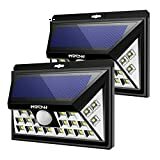 Mpow 24 LED Solar-Powered Lights provide supreme lighting. Brighter than the old version and other similar LED solar lights in the market. 【Unique Wide Angle Design】Mpow wide angle solar lights comes with 3 LEDS on both the sides, which covers more area and gives better illumination. Mpow wide angle security lights can detect movements up to 33-36 feet (10-11 meters) at up to 120°. 【3 Intelligent Modes】Mpow waterproof motion sensor lights comes with adjustable Medium Light Mode, Dim Light Sensor Mode and Sensor Mode to meet your demands. Convenient to switch the suitable light mode in the backside of the light. 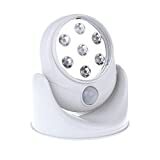 Mpow Security lights automatically bathes your home in bright and offers better home security all throughout the night. 【Energy-saving & Eco-friendly】 Mpow solar lights ensure efficient lighting as photovoltaic conversion rate is up to 17%. IP65 waterproof design can withstand harsh weather condition. 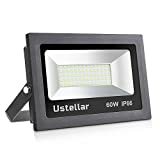 【Easy to Install】 You can simply install this LED solar motion sensor light on the wall with included screws, no wiring necessary. Save your precious time in installing the electrical wire.The ideal installation height is around 1.7 to 2 meters (5.6-6.6 feet). Warranty - Lifetime of more than 50,000+ hours and our led flood light is backed by a 24 month unlimited warranty. Waterproof IP65 - Suitable for indoor and outdoor lighting fixtures to give you a bright and safety night.Please note that the flood light can't be soaked in the water. Adjustable: you can adjust its detection distance (0-12m), lighting time (6-360s) and sensitivity of sensor (Low-high) to meet your need. 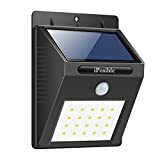 Sensitive Detector: With the help of PIR (Passive Infra-Red) motion detector, The security light will turn on automatically when it detects any movement from people, animals, or other objects. Energy Saving and Eye Protection: With the help of COB LED chips (2000LM), our product is as bright as 150W halogen bulb and can help you to reduce electricity bill by up to 80%. Then there is no IR and UV radiation, No flicker, Quick start when you use it, so it's good for our eyes heath. IP66 Protection Rating : Dust-proof / waterproof performance reach to IP66, so you can use it in many places (Outdoor/Indoor), such as patio, garden, storage, yard, garage, driveway, warehouse, deck, entrance, pathways. Guarantee : We guarantee 24 months warranty and friendly customer service. Besides, our products are easy to install and use. 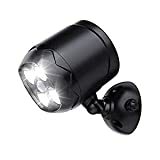 Supper Battery Powered: 4 LED wireless security lights with 600 lumens emits 6000K bright white, lights cover up to 430 sq .ft, perfectly for driveways, back yards, garages, etc. 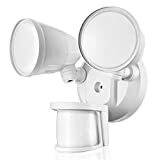 Motion Sensor Activated: The sensor wireless spotlight will turn on automatically when the motion is detected within 120 degrees angle. Auto-off 30 seconds later when the movement out of sensing range. 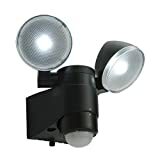 120 Degree Rotatable & Detachable: With an adjustable head that rotates to aim light precisely where needed; Perfect for indoors or outdoors use , the mounting base allowing it to be used as a flashlight. Waterproof and Durable: IP65 waterproof rating perfectly protects against humidity. Durable material can work in all weather conditions. 100% Money Back Warranty: Package include 3 Screws, 3 Expansion Pillar-Hinges, User Manual. Aglaia Promise all our wireless LED spotlight are with lifetime 100% money back warranty. Powersave. Compact and self contained. A Energy rated. 12 metre range. 120 degree angle. 90% energy saving. 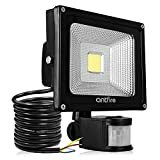 Uses only 10w and gives light of 100w. You can adjust the time that the light stays on for and also how dark it should get before the light starts detecting. Adjustable PIR angle (Up, down, left and right). Adjustable light angle (Up and down). 240v. Time on can be adjusted from 10 seconds to 10 minutes approx. 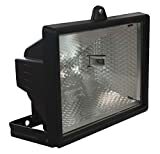 EYE-CARE:This security floodlight take soft warm light for Eye protection, with PIR (Passive Infra-Red) motion detector used to sense movement of people, animals, or other objects. ECO-FRIENDLY: Fully aluminum alloy+tempered glass case, safe, green, durable, no mercury and hazardous substance contained in our motion sensor night lights, making them perfectly ecological, No IR and UV radiation. ENERGY SAVING: With high-power COB LED chips save energy up to 80% than high pressure sodium lamp, 1800LM, aluminum alloy housing for better dissipation for longevity up to 50000 hours, Save your effort to replace bulbs in high ceiling. IP66 PROTECTION RATING: Enhances coking inside, guarantee dust-proof / waterproof performance equivalent to IP66, use it in rainy outdoors or dusty environments such as patio, garden, storage, yard, garage, driveway, warehouse, deck, entrance, pathways. CUSTOMIZED SETTINGS: Lighting time, detection distance, the sensitivity of sensor according to different ambient light environments. Easy to install and use, Factory sales, 24 months warranty and friendly customer service.